SEED is a peer-led professional development program that promotes personal, organizational, and societal change towards greater equity and diversity by creating conversational communities. Twice a month for six months, SEED participants will use personal reflection and testimony, interpersonal dialogue, and learn experientially and collectively to build personal and organizational capacity. To learn more about The National SEED ProjectSM, visit the above hyperlink. To join, please fill out this Google Form. If you have specific questions before committing to filling out the entire form, please feel free to email [email protected]. 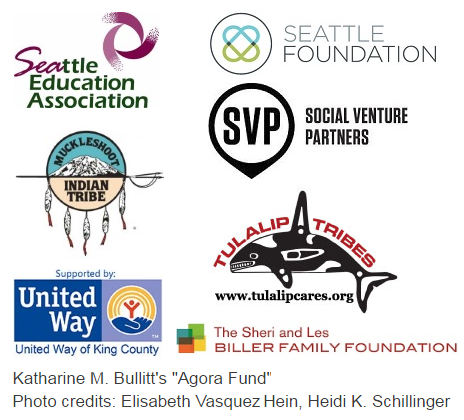 Southeast Seattle Education Coalition (SESEC) will be hosting a SEED group starting Jan 2019-June 2019. The SEED group will meet twice a month (except May and June) on Wednesdays from 9.00-11.30 a.m. at the Columbia City office (3829B S Edmunds St, Seattle WA 98118). Please see exact dates below. This timing could change depending on the needs of the group. Suggested Contribution: $100 – For Partners, $150 – For Non-Partners – Payment. Please commit to attending at least 9 of the 11 sessions. If you’re unsure of this time commitment, contact [email protected] before automatically opting out. Meetings will be in SE Seattle, meetings at SESEC office (3829B S Edmunds St) in Columbia City. Please note our office has two flights of stairs and is not ADA accessible. If stairs are a barrier to your participation, please let us know ASAP, we seek to create an inclusive environment. Priority goes to SESEC partners. Mindy will contact you if you are wait-listed. Join us at a monthly coalition meeting every third Thursday from 12.00-2.00 p.m. at the Rainier Avenue Church (5900 Rainier Ave S). Follow us on Facebook: facebook.com/sesecwa.